I think it is evident that participation, in any event, is not an all or none matter. It can vary along a number of dimensions. On each of those dimensions it can be absent, or substantial, or any point in between. At any point there may be further choices about how the participation will be achieved. Sometimes the choice is for partial participation through representation. Further choices then arise about how the wider body of people will be kept informed. The choices can depend on the desired outcomes, and the approach to participation which will best achieve them. Those outcomes are likely to include both action and research, though their relative priority may vary. As well, there may be outcomes which are decided by values. For example, I think it is appropriate for a researcher to decide that participation has a value in its own right. Sometimes this value may be high: high enough that the issue is not negotiable. Yet even here there are choices to be made. Who shall participate? In what? To what extent? For that matter, how much choice do they have in participating? implementation; the participants are implementers. designing the overall study; the participants are researchers or co-researchers. being kept informed about the study and its implications; the participants are recipients only. to what extent are they to participate? To develop this further, the first of these questions turns out to have two parts. First, there is likely to be some body of people who are able to contribute. For example, some people are equipped to provide data because they have relevant information. Second, it may not be feasible to involve all potential participants. You may have to choose some smaller number of these people to involve. In other words, when full participation is not possible, you may choose representation instead. A smaller number of participants are chosen to speak in some way for the rest. It may also be that different people will be involved to different extents. For example, you might interview a small number of people, on several occasions, in depth. Others might be interviewed only once. Yet others may respond briefly to a written survey or the like. The information from the interviews may be interpreted by a working party or reference group which is broadly similar to the community of stakeholders. In most studies, at least some participants are likely to be involved as informants. This is minimal participation (though participating as recipients is even less). It may occasionally be possible to obtain data through observation, or from documents. But in change programs, this is unusual. To achieve research outcomes, this is often a very important form of participation. The selection of participants often proceeds in three steps. The first step is to identify those people who are likely to have information (or an attitude or opinion) about the situation being researched.The second step is required when it is not possible to involve everyone as informants. Your task then is to compile a sample which will canvass all views, and be small enough to be managed within the constraints of time and budget. In general, your best option is to aim for a “maximum diversity” sample. 5 Sometimes you know enough about the various people that you can achieve a diverse sample almost from the beginning. You may then get good results by collecting information until new information ceases to emerge. As with action research generally, the emerging information determines the sample size. The third step is to decide what information is needed, and how it can best be gained. Again, action research methods allow you the luxury of being able to change your mind about this in the light of your early experience. The criterion for selection is: Who has the information needed to define the situation? This is not as simple as it sounds. Obviously, you will usually include members of the system being studied. Depending on the desired outcomes, you may well want to include outsiders with special knowledge. A common form of this is where participants first contribute information, and are then asked to comment on its meaning. In other words, each participant becomes her 6 own interpreter. In the process for focus groups that I have described elsewhere, a phase of information collection is followed by a phase of interpretation. 7 Many processes for community or organisation development also involve participants in interpreting their own information. On other occasions, different participants are used as informants and interpreters. Interpretation may be done, for example, by a small working group which takes overall responsibility for the study. It is common for a group (sometimes know as a “reference group”) to be set up with the express purpose of helping to interpret the information provided. It may have other duties too. Other variations are possible. In some forms of unstructured interviewing, for example, I may ask later informants to comment on the information arising from earlier informants. The criterion for selection of interpreters is: who has an adequate knowledge of the situation and the language of the participants? There are many techniques used in fields such as community development and organisation development. Many practitioners who work directly with a clientele have specific procedures for working with participants. Such techniques and procedures very often involve the same people in providing information, interpreting it, and turning that interpretation into action plans. For example, consider those forms of team building which work by improving role relationships. The members of the team first define their roles as they currently exist. They may then identify the problems and opportunities for improvement. Finally, they decide how they will change their roles to better manage their interdependencies. Processes such as search (a technique for developing a shared vision) are more informative, in some respects. In team building, participants too easily resolve their issues by creating difficulties for those who are not present to speak for themselves. So techniques such as search may take more care to identify all groups who have some information to give, or some stake in the outcomes. In other respects, they are similar to team building. They, too, typically move from information exchange to interpretation to planning. The point is this… Techniques such as role negotiation and search (and many others) generate and interpret information. For the most part they are used primarily to bring about change. They can also be pressed into effective service as tools for action research. When used for action research, more care is usually taken to validate the information and interpretation. They then also become more effective tools for change. The selection criterion for planners is: Who is best placed to convert the understanding of the situation into plans for change? All else being equal, my own usual answer is: those who are going to be affected by the change. Finally, plans are implemented. Here the choice is usually relatively easy. The simple criterion is: who is in a position to implement the plans? A more effective criterion is: who is in a position to implement the plans, and is motivated to do so? So far, the participants have been involved only in the content of the study. In addition, you may decide to do what you can to share the research responsibilities — to make co-researchers of them. Some common applications are to use local informants as interviewers, or facilitators for some of the group-based methods of information collection and interpretation. Some processes are robust enough that it is not difficult for members of the client group to facilitate them. Structured interviews are an example. The criterion for selecting facilitators is: Who has the skills and motivation to manage parts of the action research process? Sometimes you may decide to help participants develop the necessary skills before proceeding. There are costs in time and effort; these may be justified by the benefits for the participants. So it may be part of your intention to help participants to do their own action research in the future. This may fit in well with their intentions, too. Action research methods are often a useful addition to the skills they use in the normal course of their work, or whatever it is that they do. It is possible for those involved as participants to be involved also in designing and maintaining the research process. The criterion for selecting researchers is similar to the previous category: Who has the skills and motivation to manage parts of the action research process? As before, you may often choose to help participants develop the necessary skills before proceeding. Finally, in many instances, you will decide not to involve all of those who might have an interest in what you are doing. Numbers may be too great. Often, time will be short and money scarce. You will then have the task of keeping the wider group of potential participants informed about what is happening. In fact, the smaller the group of people you involve actively, the more effort it requires to provide some involvement for the rest. Which brings me to the final point in this document. Representation: involvement is offered to a sample of potential participants. If you choose the second option, I believe there are two other things to do for best results. First, encourage those directly involved to act for all of those who have a stake in the issue, not as representatives. Second, give attention to communication in both directions between your sample, and the others. With some simplification, I have suggested that there are seven dimensions of participation. Participants may be: informants; interpreters; planners; implementers; facilitators; co-researchers; or merely recipients of information. On each of these dimensions, a range of involvement is possible. This can involve all, or some, of the stakeholders. For each, you may involve the same, or different, stakeholders. Sometimes, less than full participation is attempted. I have argued that it is then important to consider carefully the role of those less directly involved. They can contribute information, and be informed about what is happening. As I said at the beginning, for me participation isn’t all or none. It is a choice. Or, rather, it is a large list of choices. I incline increasingly to the view that many of the categorisations of research paradigms are somewhat arbitrary. There are many dimensions along which a research design might differ. Researchers might design each study by examining each dimension. They might make their choice on that dimension as the best choice to achieve their research outcomes, taking into account the situation, the stakeholders, and their own skills and experience. I suspect that if this were done, many choices would not correspond to existing forms of research. Picture each design as a point in multi-dimensional space. Then it may be that the points would be widely distributed. If you consider actual designs, I suspect a very different image results. I think that designs would cluster heavily. And the reason, I suspect, is that people make many of the choices implicitly. They use the methodology and methods they were taught. To make my own biases clear… I value participation highly. My own autonomy is dear to me; I try to accord to others the same autonomy. This means that I prefer not to assume what they might prefer, but rather to consult with them about that. I think that those who know me would agree that I put considerable effort into building high levels of involvement and autonomy in what I do. I agree, too, with many of the advantages claimed for participation. In particular, I think that people are in general more committed to their own decisions than to the decisions of others. There are practical reasons, then, to aim at high levels of participation. This is sufficiently different to the procedure for quantitative research that perhaps I should say a little more. In quantitative research the aim is to develop a description of the sample that is also true for the population from which it is drawn. To improve representativeness, a “stratified random” sample is often used. Key dimensions on which people differ are identified. The sample is chosen randomly within each of those classifications. The CGAP works to fill in what is missing in our community/s. At present, the main thing being a proper independent institution that can facilitate and encourage community involvement in decision making and action in issues and developments that will affect ordinary people most. We will do this by developing a common good fund asset, namely an old farmhouse building in Elder park Govan, back into community use and control through democratic means. The groups efforts are guides to help get people started to finding their own paths. They are not instructions on what to do. The problems in our communities are far to diverse for plug in answers. This is one of the biggest problems, is that authorities apply one size fits all solutions to problems in our communities that are far to complex for this approach. Only individual communities themselves know what is needed, they are the experts closest to their own problems. What we offer is a half empty toolbox that can be added to. Some of the tools will need replaced, improved on and maybe even cast aside. We are a volunteer group. We have no financial interests in what we do and are affiliated to no political party. Like a union we are only as strong as our members. We are passionate in what we do, but fully understand we can not do it on our own. • The importance of self determination in affecting any kind of change. • Using the privilege and liberty we are afforded by the sacrifice of others before us. • Building solidarity around discovering what the community cares about most. • Creating useful strategies that are adaptable to encouraging –getting started. • Using work already done (ideas) rather than creating more work for people. • Carrying out activities with imagination and making them enjoyable. • Documenting this process as freely available collateral towards progressive change. And to help build structure we can develop and expand for the use of ourselves and others. CGAP is committed to ensuring that the rich diversity of the community is well represented in the process. We will tailor a strategy in collaboration with our local partners, to recruit participants and reach our established targets. CGAP will work with local partners to provide participants with accessible materials that frame the issues involved and provide a baseline of data upon which participants may begin their discussions. This framing process may involve identifying a series of choices that must be made by the public in order to address our challenges. Every person who participates in an CGAP meeting plays an active role in the deliberations. Every voice is heard and no ideas are lost. CGAP meetings foster consensus among participants and identify shared priorities. Our use of technology will support participants in identifying community-wide priorities out of a true discussion. As themes emerge from the discussions, they will be reported back to the group for decisions on what to take forward. CGAP will design our citizen engagement initiatives to create the conditions needed to produce meaningful action and change. CGAP team will help to craft the scale, composition and design of the engagement strategy to build credibility with the community, the media, key stakeholders and the public as a whole. We are working also to development of a national infrastructure for democratic deliberation that institutionalises the links between decision-makers and citizens in determining public policy and the right for citizens to help form the questions around things that affect them most. With a national infrastructure in place, public discussions could be organised quickly to generate citizen input on the important issues we face country wide. • Develop appropriate technologies and approaches to facilitate effective dialogue. Taking Govan, or the city as a whole. Can you think of any independent resources that are representational of the communities interests first an foremost? And maybe there are such groups already working on such things do you know where they are? Where do you go if you feel inspired to do something, to change something, to find others to help or collaborate. To find out if folk are already thinking or working on what you are interested in. Where can we help to plan and put together ideas and documentation towards useful community development. To find accessible information. To help form the questions, to be involved in making the decisions in things that directly affect ourselves or our community. • the disappearance of public owned land and assets. • lack of access to a range of literature pertaining to community issues. • lack of information on assessing impact of outside development on the community. • lack of free accessible, friendly meeting space. • lack of accessible community mapping, to who is where and what is going on. • lack of representation and involvement in critical decisions affecting community life. • engage with folk who want to learn and to teach just for the sake of it. • create a meeting space where we can study what we don’t get at school. • learn about food and growing. • help young folk to engage in real ideas that they can get to grips with and be responsible for. • educate ourselves through critical thinking of what we need to be worried about rather than what we are told to be worried about. • encourage mentoring, skill sharing, intergenerational cooperative learning. How can we build such a resource. What learning is needed. How do we create extended involvement, participation throughout the community. How do we, keeping such things in mind, build such a place and ensure it will serve the communities best interests. • it is intended to result in some action, change or improvement on the issue being researched. This kind of research can be useful and applied to many other things that need discussed amongst the community. It sets up ways that folks concerns and opinions can be heard and how we can communicate these concerns to each other. And to outside agencies. The beginning of a PAR project may be difficult to pinpoint. It could conceivably begin with a tearoom chat about problems being experienced in the community or some particular issue. Whatever the origins of such a project it will begin with a group acknowledging a shared concern. This group may not even be able to define this concern very concretely but the PAR cycle has begun any way. Once we have started we will become aware of the options and processes available, which there are many. That is why there is a three cycle process of: Reflection– Plan – Action and Observation. Each cycle allows us to tailor our process to our needs. Within PAR there is an opportunity for folk to learn new skills while on the project that could be applied to other situations. Examples of some of these new skills included collecting and processing information and finding the best way to engage with others to bring about changes to different situations, as well as how to articulate and present ideas. This is the real value of PAR, that what you learn and the information gathered can be used and built upon to increase knowledge and scope for the use of information collected. Here we are only trying to give the reader an overview of what is entailed in carrying out action research and the purposes of carrying out action research projects. The presentation of models and definitions of action research can only give a hint of the flavour of the experience – to digest the nature of action research fully you need to be an active participant. • Action research is participative and collaborative; it is undertaken by individuals with a common purpose. • It is situation-based and context specific. • It develops reflection based on interpretations made by the participants. • Knowledge is created through action and at the point of application. • Action research can involve problem solving, if the solution to the problem leads to the improvement of practice. • In action research findings will emerge as action develops, but these are not conclusive or absolute. • Action research is a method used for improving practice. It involves action, evaluation, and critical reflection and – based on the evidence gathered – changes in practice are then implemented. • Acting and observing the process and consequences of the change. • Reflecting on these processes and consequences and then replanning. W H A T I S A C T I O N R E S E A R C H ? PAR is about gathering information to find out about what folk in the community are thinking about. It is the kind of research that is used in order to do something. Such as develop the farmhouse. PAR is a form of collaborative research, education and action used to gather information to use for change on social or environmental issues. It involves people who are concerned about or affected by an issue taking a leading role in producing and using knowledge about it. These sections are intended to provide guidance on what a PAR project commonly looks like, how to work together and some questions to ask as you go. It does not provide advice on methods, as these will vary depending on what the research is about. There are many sources available for methods to use within a PAR research approach. When would we use PAR? If you want to gather and use information so that benefits come to the people it directly affects. PAR is used by a whole range of community groups and organisations (where people already know each other and/or work together), and also by groups that come together for the purposes of research and action on a particular issue. PAR is an approach to research. It is a set of principles and practices for originating, designing, conducting, analysing and acting on a piece of research. PAR is not a method. Within PAR projects, many different methods may be used – group discussion, interviews, diagramming, video, photography, art, surveys, mapping, the collection of environmental data, computer analysis of datasets, etc. The farmhouse is a building that sits in the community garden in Elder park Govan. The building is part of the Common Good Fund (Explained elsewhere) and has lain derelict for 30 years or so. 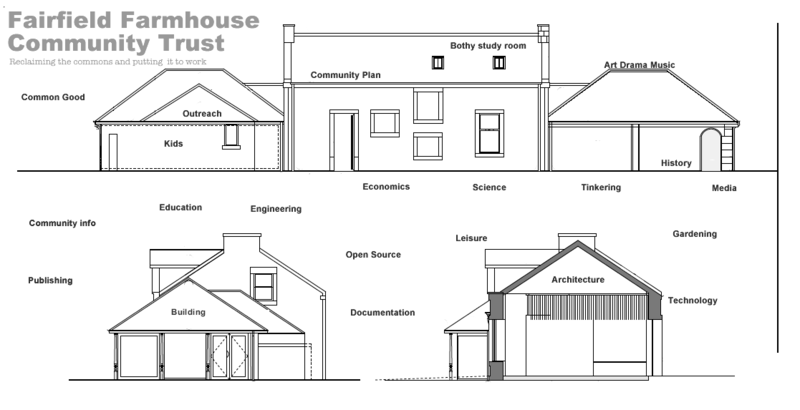 The project to renovate the building as a resource centre has over the last few years taken on different approaches and attempts bring the building back into community use. The purpose of the PAR project is to reinvigorate the project and to open up the discussion to the full potential of what this space not, only be used for, but could represent symbolically within the community and beyond. 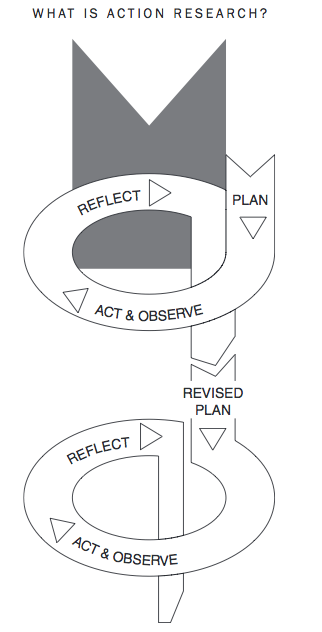 In this way, research in PAR typically goes through a cycle: Planning, Action, Reflection, Evaluation. You may undertake these cycles every time you meet, or you may, for example, save the evaluation until the action is complete. Action Establish relationships and common agenda with all stakeholders. In PAR, there is no blueprint for must-have methods or steps to go through (the action part of the research cycles). What follows are some questions for the PAR group to address as the research progresses (the reflection part of the research cycles). These are ordered under 7 themes that are central to PAR: collaboration, knowledge, power, ethics, building theory, action, emotions and well-being. We include some guidance from our own experiences to help you to address these. It is important to remember that PAR has to remain flexible in use. This means that actions sometimes change, and even questions can change, as everyone in the group puts their learning into the ring. This doesn’t mean that PAR is a ‘soft’ or ‘unscientific’ way to do research. It is a valid, widely accepted alternative to a traditional scientific approach, and can be more appropriate for certain topics. Who will be involved in conducting this research? Most often, an existing group will decide to use PAR to address an issue of concern to them. If the research project is entirely run by policy-making bodies, or University researchers, it is unlikely to be PAR. Sometimes a collaboration can turn into PAR (in our case, University researchers applied for research funding based on previous joint work, and then worked with the wider group to determine the research questions and process). What roles will they have? For example, it is common to have a smaller group involved in planning and undertaking the whole research project, drawing a wider group/community into certain stages of the research. Or the whole group may follow the whole process through, or group members may drop in and out. Do we need to invite outside experts? People external to the group may be able to provide training, use certain methods, or offer guidance on specific aspects of the research or dissemination of findings. However, there needs to be a reciprocal agreement about who owns the research and how it will be used. What principles will we agree in working together? It is important for these principles to be collectively decided and that everyone has a say. Examples may be about, for example, communication, ownership of data, or the use to which they are put. How will we work? For example, how frequently do we need to meet, and what will we do between meetings? This will depend on the projected timescale of the research, as well as group members’ availability and time. Who will facilitate meetings? This could rotate, or roles can be allocated from the start. It can be useful to have someone with experience facilitating meetings. However, it is important that this person does not let their views predominate over other people’s in making decisions. • WHAT will be done? • WHO will be involved? • WHERE will it take place? • WHEN will each stage happen? • HOW will we do this? Inevitably, these plans will change as the research progresses: new ideas, sources of data, people whose opinions need to be asked, often surface. Equally, some plans might turn out not to be possible or are superseded by other ideas and priorities. We found it was important to make sure, as far as possible, that everyone in the group had the same opportunities to suggest these changes, so that no one person dominated. How will we build in opportunities to reflect as well as plan and act? Building in a 15 minute roundup/evaluation at the end of each meeting can be useful. In our group, we found that reflection took place all the time, as participants were very critical and engaged with the research. Such reflection can sometimes feel like it is slowing you down, but it is essential to get to where you want to be. What questions are most important? Your PAR group may already know exactly what the research will be about. If not, it is often useful to ‘brainstorm’ as many issues as you can think of, and then evaluate and rank them in terms of importance and feasibility for your group to address. If you have an issue already, brainstorming can help to gather together what the group already knows, and where the gaps lie. It took our group several meetings to agree on the issue, and pinpoint exactly what the specific research questions would be. What different kinds of knowledge are going to be important? And do they match the knowledge that people in the group have? For example, will you need particular datasets about people or the environment? You may need to apply to get access to these, or you may be able to gather your own data. Again, will it be useful to ask other people with specific expertise onto the team? Bear in mind that people who don’t usually conduct research can be sceptical about the value of their own knowledge. This was the case of some of our group members, but everyone turned out to have detailed and critical knowledges about some aspect of the project – some from their jobs as engineers, academics or farmers, some through interests such as environmentalism and angling, some from experience of living close to the river. What methods do we need to use to find the answers to our research questions? Any research methods can be used in PAR. The most important principle here is that they are able to give answers to the research questions you have decided on. On our project we used a range of mapping, modelling and environmental survey methods to investigate farmyard vulnerability to slurry pollution. However, a range of social research methods would have been useful too, if we had decided to find out more from farmers or other people or organisations. What kinds of skills will be needed? Do we have these skills among the group, or do we need to bring in other people to provide help? Doing research collaboratively doesn’t mean that everyone needs to understand or be able to use those skills: tasks can be delegated to certain people. What can each person present contribute to the research process? For example, there are tasks aside from the research itself, like organising meetings, note-taking, and communicating with a wider reference group. Who usually carries out research and makes decisions on issues like the ones we have identified? It can be useful to ask this question, to help establish how the PAR project will change this. On our research issue, local knowledge has rarely been the basis of research or policy – instead, the group identified a tendency for environmental policy to be ‘parachuted’ down and not necessarily locally appropriate. Does our research allow others (outside of those who usually undertake research) to plan the research? PAR is often used to try and relay alternative knowledge and opinions to more powerful groups or organisations. Are those people who are facilitating and involved in the steering group representative of the wider group affected by this issue? Sometimes, in an attempt to draw in ‘professional’ expertise and influence change, PAR projects are peopled by those already in knowledge-creating groups. Having better representation is important, if PAR is going to relay alternative knowledge and opinions. Are there people who are not represented, who we need to involve at certain stages? If so, how? For example, our PAR group decided from the start that it would be important to have farmers involved, both for their knowledge of slurry and farming, and to advise on effective actions so as to avoid alienating farmers. However, it was difficult to get farmers to come to every meeting (as it was lambing season), so a planned action was presenting and disseminating the findings to farmers. How will we conduct meetings so that everyone is listened to and nobody dominates? The role of the facilitator is important here. This role (which might rotate) involves allowing everyone to speak. Using ‘diagramming’ or paper and pen methods (e.g. a flipchart on the table in front of everyone) can help to encourage everyone to put ideas in. How will we deal with disagreement, be sure that we don’t gloss over differences, but discuss and work through different opinions? Spending time discussing issues fully is never time wasted. Again, good facilitation helps (above), and diagramming can help with evaluating and prioritising different issues, ideas and actions. We found this essential for agreeing on the research questions, and taking decisions along the way. You may decide that the findings and outputs of the research should reflect these differences. Do individuals (or the whole group) want to be anonymous? Depending on the topic of the research and its sensitivity, you may decide on a blanket policy on this. Often participants may choose for themselves. Anyone who is interviewed as part of the research should be asked whether or not they wish to remain anonymous. How are we going to store information in a way that preserves confidentiality? When you store data about people, you need to comply with the Data Protection Act, as well as respect any sensitivities or concerns that the people involved may have. How are we going to be accountable? This can be addressed by thinking about how to record what is said and what happens during the research process, from the start, and deciding who should get to see this information (so long as you comply with the DPA, see above). There may be situations, people or organisations from which it is wise to safeguard certain information; these can be identified early on or may become evident as the research progresses. What are the potential sorts of harm that the research might cause? How can we avoid these? All research carries risks. For example, research can cause environmental damage, cause distress to people, or inflame local conflicts. On our project, the LRT had good working relationships with local farmers which they did not want to jeopardise. Through careful discussion and planning, we worked out in advance how to promote and use the farm vulnerability model without offending or ‘finger-pointing’ at individual farmers. What are the potential benefits the research might lead to? How can we maximise these? One of the main reasons that groups use PAR is to see some benefits from the research, so it is worth thinking hard and creatively about this. Record early on what the group hopes to get out of the research, and revisit/update this regularly. How will we record discussions, ideas, and the development of the research? You may want (with everyone’s consent) to tape record meetings, or simply to have a note-taker. It is also important to summarise key points and actions after each meeting, and to circulate these to everyone. How will we stand back from time to time to reflect on how the research is going and what has been achieved? Again, this underlines the importance of building reflection into the research cycle – one way of doing this is after each meeting (above), or you may decide to do it less frequently. Who will be involved in analysing the findings, and will everyone understand how this was done? Depending on the sorts of data and methods of analysis needed, you may delegate this to one person or just a few people. They should report back clearly on what they have done. Who will be involved in interpreting what the findings mean? How can a wide group be involved in making sense of the findings and drawing conclusions from them? As PAR groups research a collectively agreed issue, everyone is able (and has the right) to interpret what the findings mean and their implications. This way, a number of possible interpretations are most likely to emerge and be evaluated. This is a key stage in – and benefit of – the process of creating knowledge collectively. How will we plan what outputs should be produced from the research? Will some people take a leading role in writing up the findings, and if so, how and when will others have input? On our project, everyone was involved in discussing the most useful outputs and where to disseminate them. The university researchers took a lead on writing as they had most time to commit to this, and other group members had opportunities to have input. Outputs were co-authored by the University researchers and the LRT to reflect the collaborative nature of the research. What changes are needed, according to the findings of the research – e.g. to understanding, behaviour, policy? Deciding on the implications of the research for action is a crucial stage in PAR. Occasionally, a PAR group might agree that no action is needed (for example if the findings show there isn’t a problem after all; or everyone agrees that the learning that has taken place during the research is enough). Who will do what? Who has the time and ability to get involved in follow-up actions? What resources would help? Should the findings be shared outside of the group for this to take place? Sometimes, the findings will be used only by the group itself. Often, you may want to use them to influence others. In our research, the LRT was clear that it wanted to use some of the research outputs (maps, toolkits) in its own work, but also to be involved in promoting and disseminating the work much more widely. The outputs were therefore written with the specified audiences in mind, including national policy-making organisations. Presentations at follow-up conferences and workshops were made jointly by the academic researchers and the LRT. How do we want to share and promote the findings of the research? There are lots of possible modes of disseminating findings, and you should decide which are most appropriate and feasible. For example: a public meeting, a report to policy-makers, a press release, a poster campaign, a website, direct changes to practice, advocacy work, further meetings with those responsible or affected by the issue in your research. Who could help us to get the messages across and stimulate change? Sometimes, it is useful to recruit people in more powerful positions or organisations to help promote the research findings. Making them aware of the research at an earlier stage means they are more likely to respond when it is complete. Is the research topic something that people care passionately about, or that directly affects their well-being? Generally researchers and scientists are presumed to put their feelings to one side when conducting research. But none of us actually do. Especially where we are researching a social or environmental issue that we care about, it is normal to feel emotionally invested in research to some degree. Depending on the topic, strong feelings may be involved and these may affect participants inside and outside the research meetings. The research process itself, especially where a group is working together, can impact people in this way too. This includes experienced researchers and scientists. In our group we were explicit about these feelings at various stages. Talking about this aspect of the research with each other, as part of reflection, improved our understanding of the research and the decisions that we were making. How will we ensure that the space we work in is as comfortable and hospitable as possible for participants? It is important to provide a space where all participants feel comfortable, for participation to work well. Decisions about the venue for meetings and the refreshments provided may seem trivial, but making sure they suit everyone makes for a happier and more effective research project. How will those involved in meetings deal with negative emotions? As discussed above, there may be differences or even conflict with PAR projects. Anger or hostility may surface during meetings, and facilitators and others should have a strategy to deal with these. Might the research affect others outside of the PAR group? Thinking about the possible impacts of the research on other people’s feelings and well-being (e.g. if it raises sensitive issues for them) is part of planning the ethics of the research (above). Do we have back up strategies, such as pointing people to sources of advice for particular problems or counselling services, for participants who need them? This is only likely to apply if the research is on particular topics, but is part of the responsibility and the ‘ethics of care’ of good researchers. Kindon S, Pain R and Kesby M (2007) Participatory action research approaches and methods: connecting people, participation and place. Routledge.